Buhari inaugurates advance cancer treatment centre in Lagos. 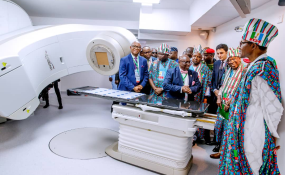 Abuja — President Muhammadu Buhari Saturday in Lagos unveiled the Nigeria Sovereign Investment Authority (NSIA) and Lagos University Teaching Hospital (LUTH) Advanced Cancer Treatment Centre, with a pledge to ensure that facilities for the prevention, early diagnosis and treatment of cancer are available to many more Nigerians. During the inauguration, the Chief Medical Director of LUTH, Prof. Chris Bode described the centre as world-class, saying no Nigerian cancer patient needed to travel abroad again to receive treatment easily obtainable at home. "We, therefore, want to assure Your Excellency that we shall give what it takes to run this Centre as a pride to all Nigerians. NSIAs investment is not only safe but will yield ample dividend to encourage other deep pocket investors to open up the health sector as a veritable investors' haven." In the same vein, the Minister of Health, Prof. Isaac Adewole, described the centre as the single largest investment in cancer treatment in the country by any administration since independence. Adewole added that the facility could treat 100 patients daily and provide training for over 80 healthcare professionals, among many others. In a statement by his Special Adviser on Media and Publicity, Mr. Femi Adesina, the president promised to replicate the model across the country with a view to bringing quality, first-class healthcare services to cancer patients in Nigeria. Adesina quoted Buhari as saying, "We are aware that up to 40 percent of funds spent by Nigerians on medical tourism is attributable to patients seeking treatment for cancer. Despite having an increasing number of citizens suffering from cancer, we until now, had only two working radiotherapy machines in the country. "Working through the NSIA and LUTH we utilized a PPP model that unlocked investment capital to directly address this issue. We will replicate this model across the country to bring quality, first-class healthcare services to as many Nigerians as we can. "Indeed, over the coming months, under our leadership, the NSIA will commission two Modern Medical Diagnostic Centres to be co-located in the Aminu Kano Teaching Hospital, Kano State and the Federal Medical Centre Umuahia, Abia State, respectively, bringing additional investment to Nigeria's healthcare sector." Adesina also said the president, while wishing the management of the hospital good luck in operating the centre, emphasised the need for maintenance of the equipment. "Our goal today is not simply to celebrate and applaud the culmination of months of hard work to achieve this objective. Neither is it solely to revel in the successful completion of the most modern and best-equipped Cancer treatment centre in West Africa. "Indeed we are proud, but we recognize that this modest effort to address the gaps in our tertiary healthcare system alone is insufficient to address all the challenges faced by the sector. "Today, we showcase what feats we can accomplish when we are together, unrelenting in our effort to deliver a common objective. "No one ever prays to be diagnosed with Cancer, but if they are, what we have made possible here today is the hope that a true chance of survival and good quality of life becomes part of the story of many Nigerian patients with cancer," he was further quoted. Adesina also said the president promised that his administration had introduced programmes meant to alleviate common diseases, including the Basic Healthcare Provision Fund. According to him, Buhari said the fund was targeted at ensuring access to primary healthcare for all Nigerians, adding that he would continue to canvass awareness about cancer, educate the people and facilitate early diagnosis. The statement added that the Managing Director and Chief Executive Officer (CEO) of NSIA, Mr. Uche Orji, said the centre was expected to raise the bar in the quality and standard of cancer treatment in Nigeria with outcomes that he said would be consistent with the 2030 agenda for sustainable development. "In addition, this Centre will demonstrate the economic potential of healthcare investments in Nigeria and catalyse increased private sector participation."